Transfer balls: Has Jamie Vardy told Arsenal he is joining them? The Sun said Vardy told the Gunners of his decision before 11:30am this morning, when he and the rest of the England squad jetted off to France for the Euros. Why he needed to make his move before the flight left is moot point. surely in France there are mobile phones? Vardy, travelling with England, is not believed to have put a time limit on when he will make a final call and any announcement may take longer than another 24 hours. Mercury sources have stated there is no decision imminent as the player has much to contemplate. 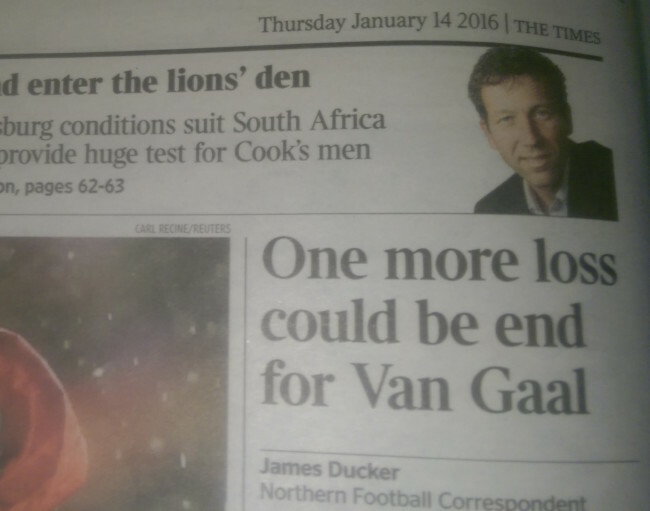 Surely he’s already made his mind up. More money in his weekly wage packet plus a huge signing-on fee and life in London with Arsenal. Jamie Vardy to Arsenal is one of the Sun’s lead stories. The back page has Olivier Giroud, the Arsenal striker, saying how much Vardy wants to join Arsenal. Readers learn that Vardy, 29, will tell Arsenal if he wants to join them before 11:30am today, when England board the plane to France. Will he accept a four-year, £120,000-a-week deal to play for the Gunners? The Mirror says Leicester will make a “last bid” to keep Vardy. If that fails the Foxes will move to buy Watford’s Troy Deeney. Deeny had best call his agent. 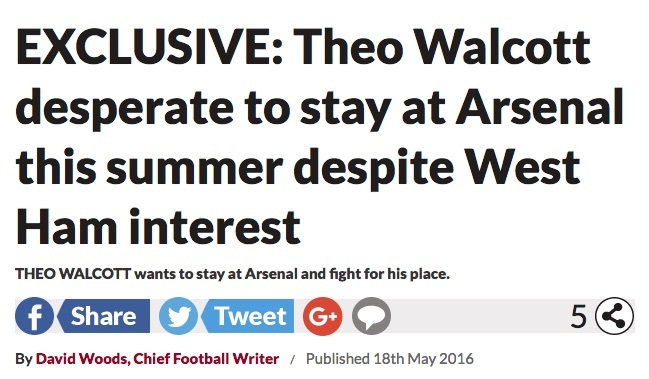 The Mirror says it was Vardy’s reps who made contact with Arsenal a month ago. Arsenal mulled it over and now want the player. But will Vardy work well for Arsenal? Writing in the Express, Matthew Dun says Vardy at Arsenal is “mismatch”. He says for Vardy to perform well at Arsenal, Arsene Wenger will have to “rip up his two-decade -old playbook” or Vardy would have “about three weeks after the Euros for a crash course in the Arsenal way”. Dunn reasons that whereas Leicester play long balls to Vardy to run on to, Arsenal play short passes around the opposition’s box. He can’t see Vardy being a hit at The Emirates. Cascarino lists Vardy’s benefits to Arsenal. Vardy works hard, “harder than Giroud”; “Mesut Ozil is the perfect player to thread chances through to him – the German will love having a player like Vardy in front of him”; and Wenger know “Vardy will fight for everything”. He will. Vardy is a battler. Would Arsenal fans pick him or Theo Walcott for drag the team across the finish line. No contest. Vardy is a proven winner. 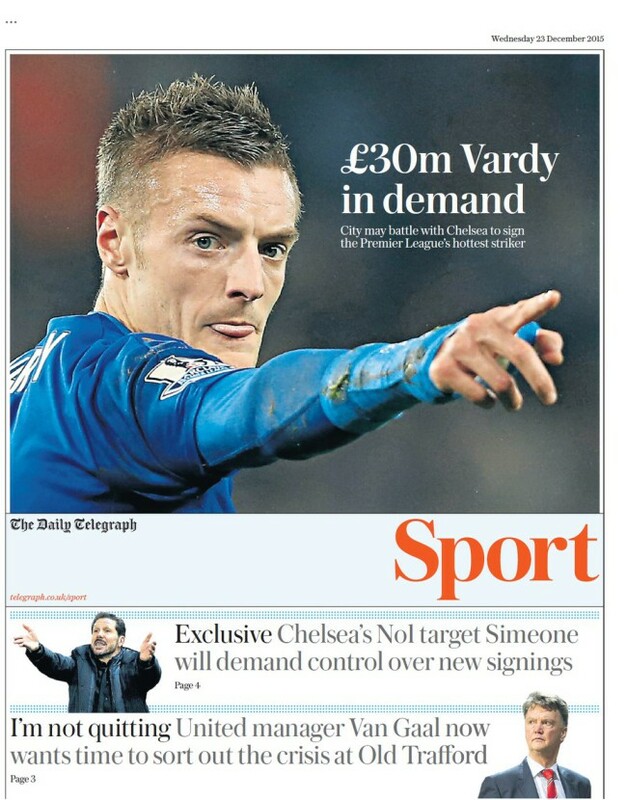 More on the Jamie Vardy’s £20m move from Leicester City to Arsenal story. ESPN says Vardy will take his Arsenal medical today. The Sunday Express says the Gunners are fearful that unless they sign Vardy before the Euros they might not sign him at all. 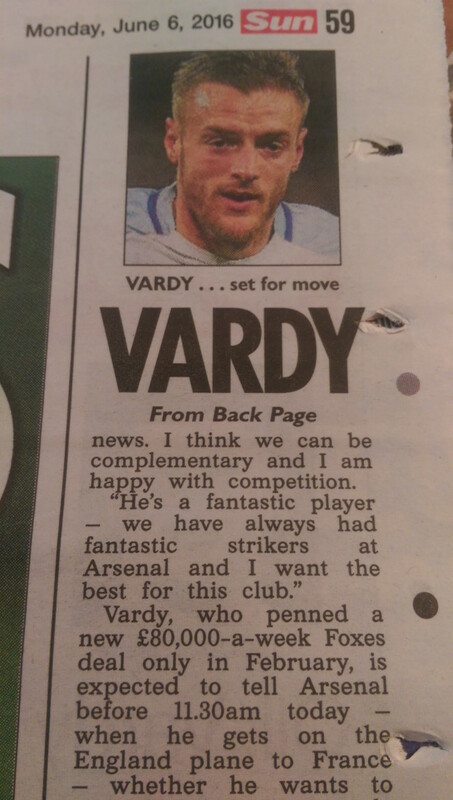 But the Sun says Vardy’s mind was made up when he spoke with Arsenal manager Arsene Wenger. In Italy’s La Gazzetta dello Sport, Leicester City manager Claudio Ranieri says he is resigned to losing his star striker to Arenal. Sky hears Arsenal’s Olivier Giroud says he knows Vardy wants to join the Gunners. The Sunday Times lead with news that Vardy’s wife, Rebekha Vardy, has received nasty messages on twitter. Leicester fans have accused her of instigating her husband’s transfer. She calls one fan “pathetic” and tells others to “calm yourselves down”. Vardy’s leaving. Leicester fans must wonder who else is looking for pastures new. Transfer balls: Manchester United want to invest £60m in Paul Pogba, the France and Juventus midfielder once on United’s books. 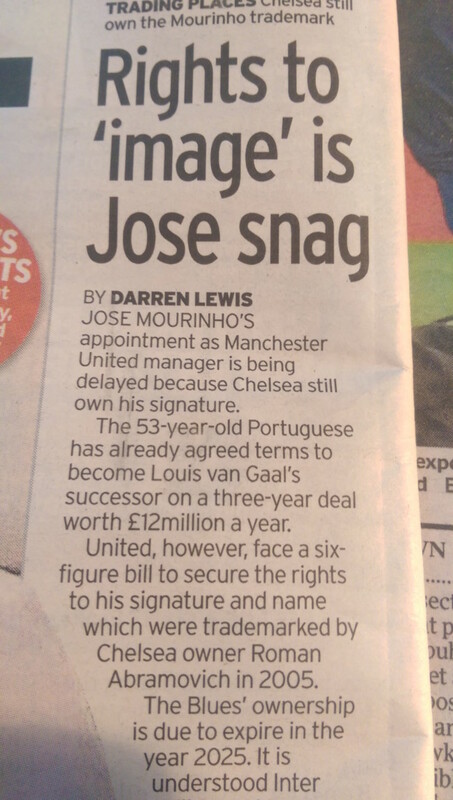 The Sun says Jose Mourinho has “sanctioned the bid”. The only things standing between United and Pogba are: Juventus trying to trigger a bidding war for their star player; Barcelona; United’s failure to appear in next season’s Champions’ League; Barcelona; any other big team with pots of cash; Manchester City; the fact that the bid is actually £48m plus bonuses, which values him less than Manchester City paid for Raheem Sterling; and did we mention Barcelona? 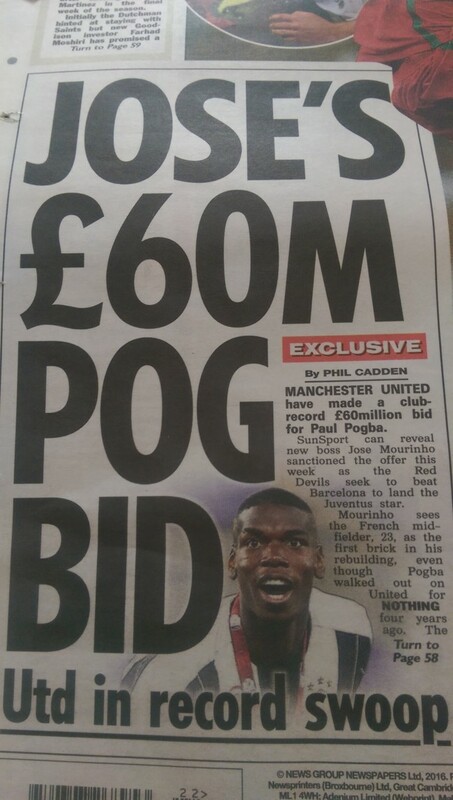 On the plus side, the Sun “understands” that Pogba likes Mourinho and his plan to make United “great again”. 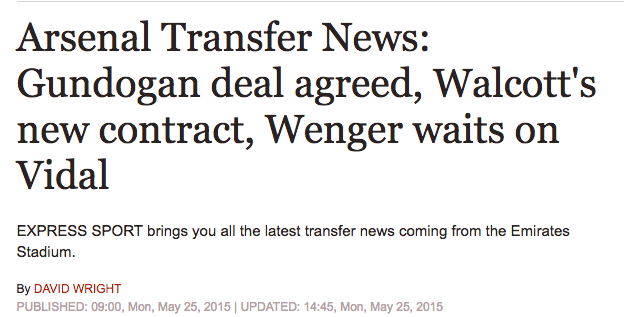 Transfer balls – a look at iffy reporting in the mainstream media. 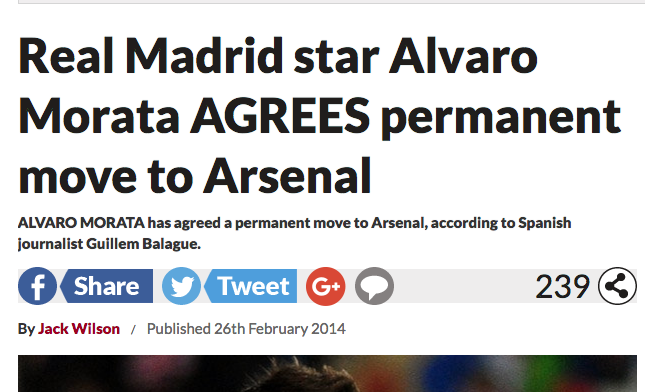 News is that Arsenal are still after Alvaro Morata. The Mirror says “Arsenal and Chelsea could go head to head in the race to sign 23-year-old Juventus striker Alvaro Morata.” So only two clubs are in for the striker. It is a head-to-head race. Transfer balls: every summer a familiar platoon of players feature in tabloid stories telling of their imminent moves to the Premier League. One of that number is Gonzalo Higuain, who, as you will recall, signed for Arsenal on July 6 2013. Well, so said the Sun. 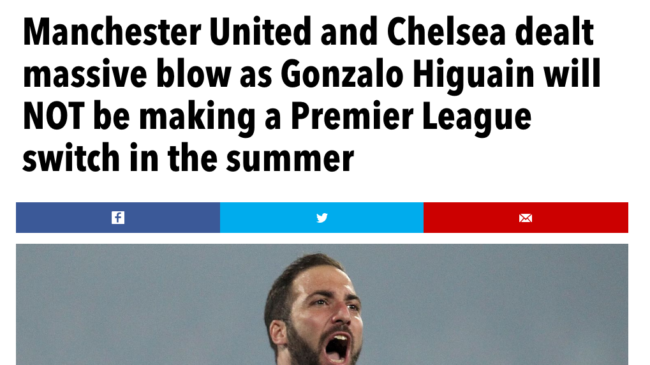 For anyone who missed that scoop, the good news is that the story of Higuain to Arsenal still features as fact on the Sun’s website. ARSENAL last night smashed their transfer record when they agreed a £23million fee for Real Madrid striker Gonzalo Higuain… Higuain, 25, has been given permission by Madrid to fly to London following weeks of negotiations. And boss Arsene Wenger has made it clear he wants the powerful goalscorer on board when Arsenal head for their tour of the Far East next Thursday. The deal, which has been confirmed by the player’s father Jorge, comes as a huge relief for Wenger… The Gunners’ previous biggest signing was the £16.5million they paid to sign Santi Cazorla from Malaga last summer and propels the club back into the big time. Now Wenger wants to build on Higuain’s imminent arrival by pressing ahead with negotiations for Wayne Rooney and Julio Cesar… Wenger believes that the capture of Higuain will convince other world-class stars to join. 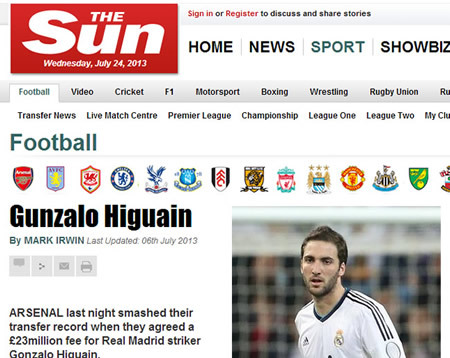 And so to todays news in the Mirror that Higuain, who plays for Napoli, has made a “plea” to join Liverpool. 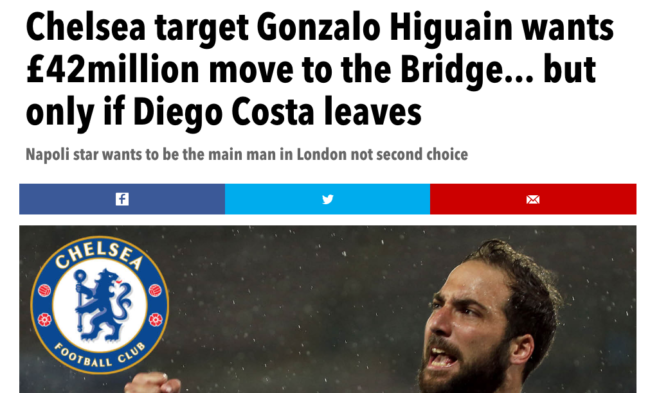 May 22, 2016: Higuain not move to Chelsea, Manchester Untied nor any other Premier League club. DID Liverpool’s Nathaniel Clyne “admit” that England’s defence, in which he plays, is a “weakness”? 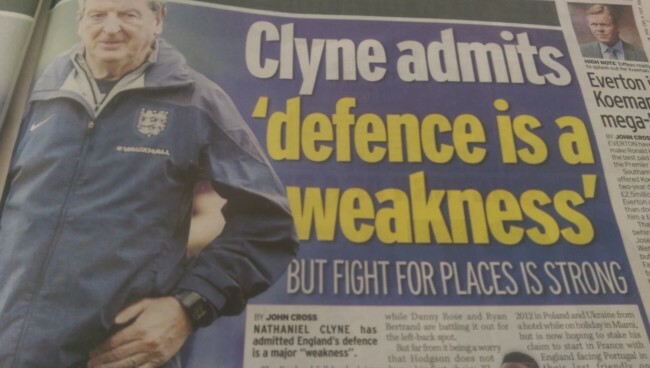 The Mirror says he did, thundering: “Clyne admits ‘defence is a weakness”. He didn’t say the England defence “is a weakness”. He said the players can be better and are working hard to reduce errors. Clyne and Spurs’ Kyle Walker are battling to be England’s first-choice right-back. Transfer balls: Is Cristiano Ronaldo, hero of Real Madrid, scorer of the decisive penalty as Real won their 11th European Cup, heading to Manchester United to play in the Europa League? 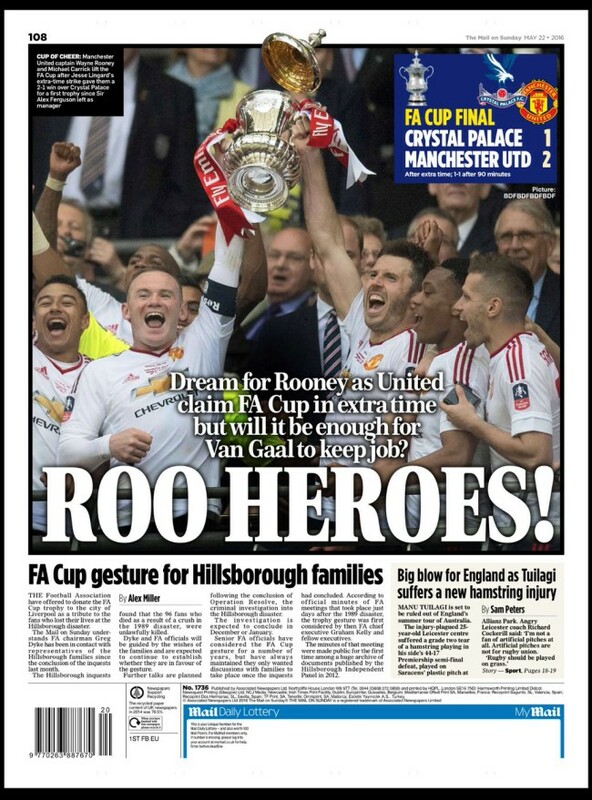 The budget is so big this summer that United already have their beaks into Cristiano Ronaldo, yet again. Real Madrid have quoted £80million for the winger. Meet that and Ronnie returns. Mourinho’s frosty relationship with Ronaldo, exposed at Real Madrid, will be set aside if the deal is done. Jose Mourinho’s Manchester United XI – Bale, Ronaldo, Pogba, Zlatan? No. No. Maybe – but why? No. What does new Manchester United manager Jose Mourinho smell like? 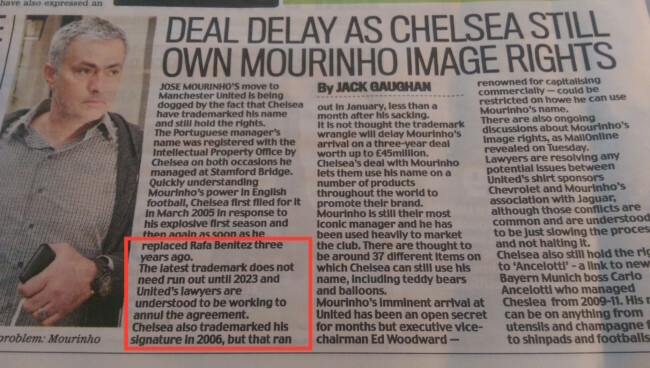 The Star reports on “Chelsea’s ban on Jose aftershave”. In the changing room, yes. Unsettling for new Chelsea manager Antonio Conte to contend with the Portuguese winner’s legacy without picking up his essence as John Terry splashes the masking Jose for Him and Her all over (spoiler alert: Revenge by Jose smells of top notes of silver polish over base notes of bile, pith and whicker basket). 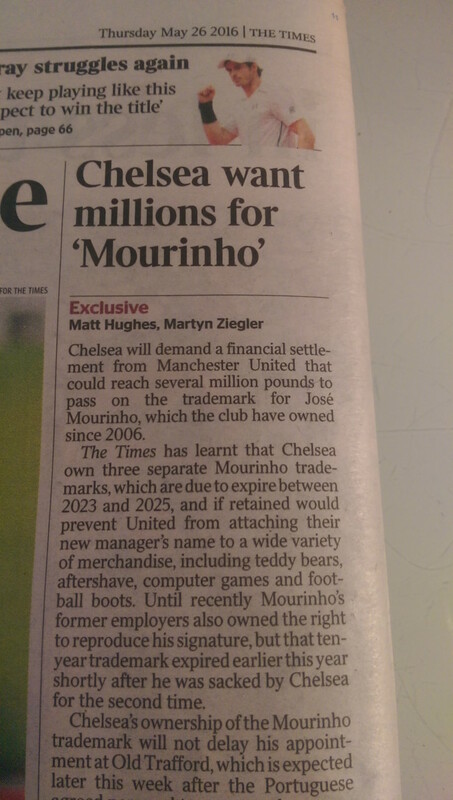 This story turns to the essence not of Jose’s scraped and diffused bed linen, rather to the story of who owns what in football. Do Chelsea or Manchester United own the rights to sell Jose Mourinho perfumes, suntan lotions, toothpaste, mouthwash, lipstick and nail polish? Which of Chevrolet (sponsors of Man United) and Jaguar (sponsors of Jose Mourinho) get to market the official in-car scent? And can you ever own someone if you don’t possess their smell? Get the smell of Jose or get nothing. Meanwhile, at Chelsea, Conte may care to invest in odor-eaters for all staff, install a wet basset hound in the Chelsea dugout and refrain from washing his hair for months. Jamie Vardy might not be at Leicester City next season. The newspapers reason that any top player, which Vardy certainly is, will want to play for a bigger club. All newspaper overlook the fact that Leicester City are champions and the only English club worthy of so-called Champions’ League football. Why leave? Well, in today’s Daily Mail, Laurie Whitwell says Vardy’s Leicester contract contains a £20m release clause. hat “cut-price fee” has attracted interest from Manchester United, Manchester City and West Ham. But Sky says Vardy’s contract contains NO release clause. The Indy says he does, and it’s £30m. The Star says the clause is £25m (The Standard agrees) , and he’s off to Chelsea. Transfer balls: It’s been a busy few days for Arsenal’s Theo Walcott. 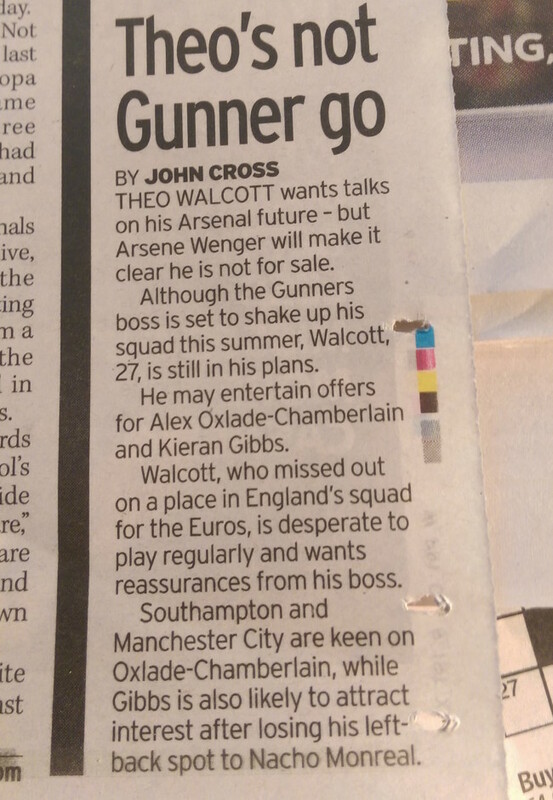 In today’s Daily Mirror, readers are told, “Theo’s not Gunner go”. 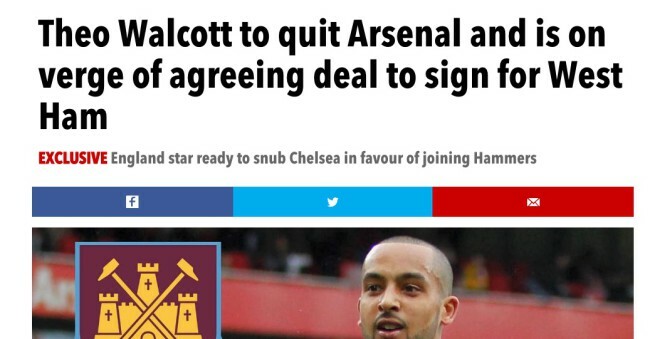 News is that Walcott will be told he is not for sale. “Arsene Wenger will make it clear he is not for sale.” This will disappoint Manchester City and Southampton, we’re told. 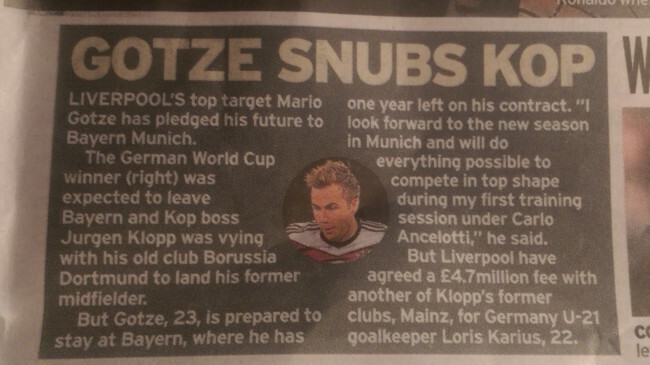 But the Metro told us Arsenal will “listen to offers” for their striker. 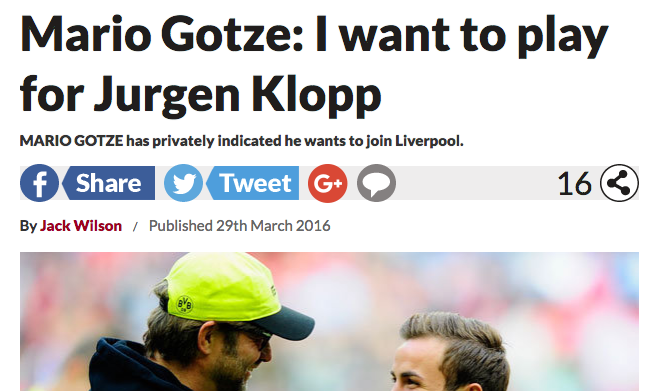 The Mirror says he is desperate to leave. Transfer balls: can you identify the Arsenal ‘ace’ on his way to West Ham? 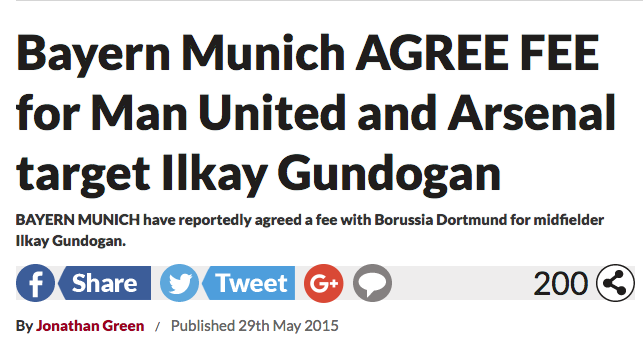 Transfer balls: a look at desperate reporting. And it’s not just in print and on websites the newspapers can spin clicks from utter balls. 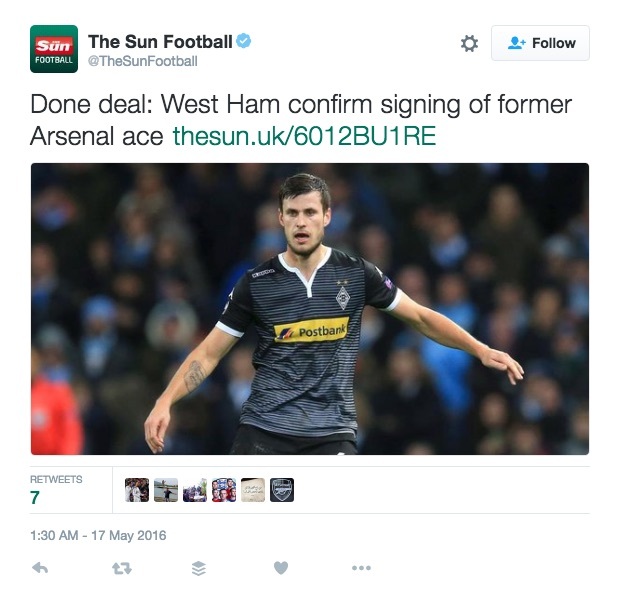 On Twitter, the Sun has news of an “Arsenal ace” on his way to West Ham United. But what of his ace-tastic Arsenal career? The Norway international, who joins on July 1, returns to London six years after leaving Arsenal – although he failed to make a first-team appearance in three years with the Gunners. One paper’s “reject” is another ‘ace”. Ozil talks with Arsenal. Boom! Moe Transfer Balls in the newspapers every day. “The debate might well be whether Marcus Rashford can force his way into the final 23 and go with England to Euro 2016. For me, the bigger argument is what Jack Wilshere is doing in the squad in the first place. Nobody seems to be questioning whether he will now go if he remains fit through these last three friendlies ahead of the finals. 20 April 2002: 51 days before the World Cup, Beckham is injured by Pedro Duscher in Manchester United’s Champions League quarter final clash with Deportivo La Coruna. His second metatarsal bone is broken. Beckham makes a hard bid to get fit. 2 June 2002: England v Sweden. Beckham plays 63 minutes of the game before being substituted. It is his first competitive action since the injury. 7 June 2002: England v Argentina. Beckham’s 45th minute penalty gives England victory. He lasts the full 90 minutes. In the quarter-finals, Beckham plays as England lose to Brazil. 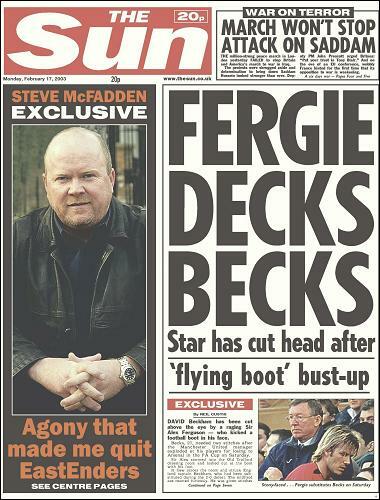 And how did the Sun talk of Beckham’s injury way back then? Were they circumspect? A HUGE team of Sun readers today prayed for the hand of God to revive England’s World Cup hopes by mending David Beckham’s broken foot. We urged our army of 10 million readers to boost David’s fitness fight at the stroke of midday by placing their hands on our picture of David’s left peg and praying for a speedy recovery. And so many of you did. And Canon David Meara, the vicar of St Bride’s in London’s Fleet Street, even came into the Sun’s Wapping HQ to say a special “get well” prayer as the entire office touched David’s foot on the dot of noon. Wilshere is no Beckham – he’s fitter. From hammer-headed Dutchman Louis Van Gaal to divisive Portuguese Jose Mourinho, United fans must wonder how it came to this, the pragmatic taking over from the dreamers. 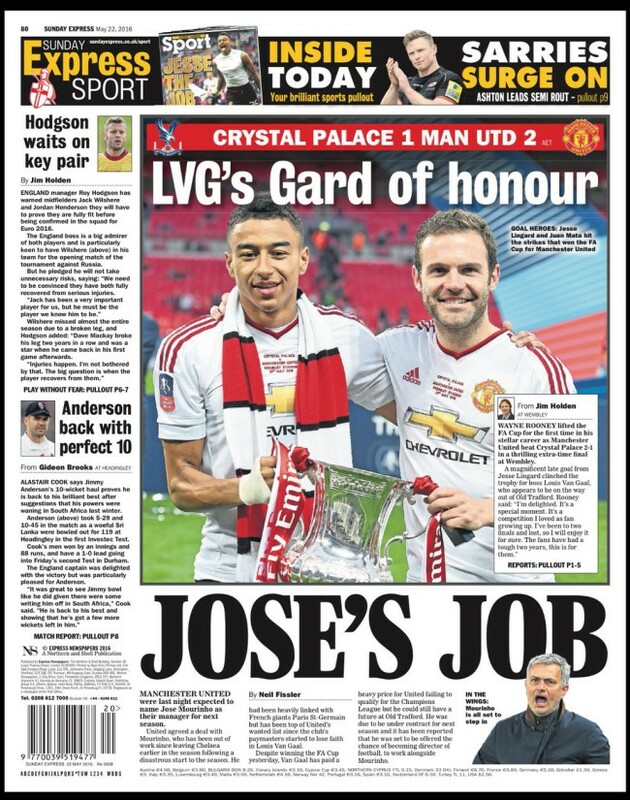 The Mail says Mourinho is the “prime contender” to replace Van Gaal “should United sack the Dutchman”. Says who? 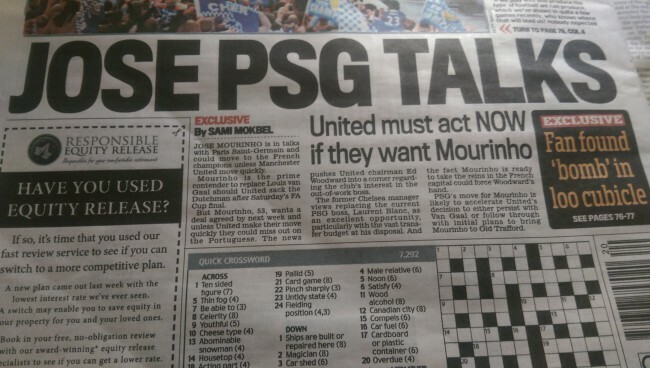 We soon find out: “Mourinho, 53, wants a deal agreed by next week and unless United make their move quickly they could miss out on the Portuguese.” Mourinho’s desperate, isn’t he. United need not rush. The French league is one-trick pony. Man United are huge. They pick the manger. The manager does not pick them. 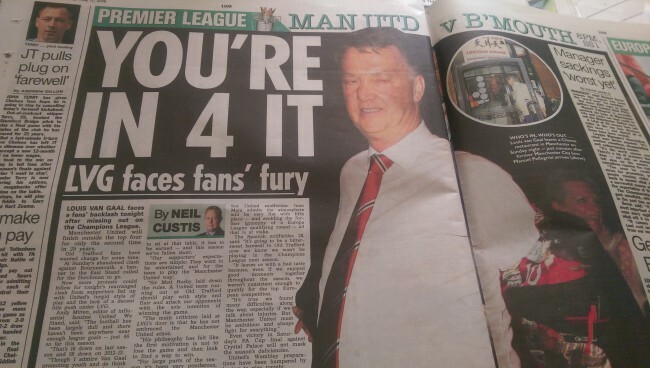 In the Sun, which has spent weeks hailing Mourinho as the next Man United boss, Neil Curtis tells Van Gaal, “You’re 4 It”, a pun on Van Gaal’s United missing out on a top finish and with it a berth in next season’s Champions’ League. Curtis says fans “protests could follow tonight’s rearranged clash with supporters fed up with United’s turgid style of play”. They could. And then again, the could not. Perhaps those United fans who can recall life before Alex Ferguson made them serial champions will be circumspect and wait and see what happens. Winning is all the more glorious when it follows fallow years. Curtis seeks fans’ fury but finds none. We hear from one fan who says he “admires” Van Gaal and does “think he will get it right in time”, and another who says Van Gaal has “an aversion to risk” and “no club has the divine right” to play in the Champions’ League. Spurs…are still a top side and you would fancy them to win at St James’ Park against a team with nothing to play for under a manager who is probably going to leave… The fans up there will be angry at how things have panned out after Sunderland beat Everton and the Newcastle players will just want the season over with. This was a peculiar day at St James’ Park, where a relegated side played with the zeal of champions and their supporters sang merrily in the sunshine and when Spurs, for so long an embodiment of promise and quality, simply imploded. Old, tired, perennial failures Arsenal — or so the narrative goes — hopped above them and a campaign that has featured upset at its core ended in a suitably perplexing manner. More expert inside knowledge from Harry Redknapp all over the media every week. JESSE LINGARD’S video from the team bus gave an insight into life under boss Louis van Gaal at Manchester United. Discipline, once a bastion of this great club under Alex Ferguson, has pretty much disappeared under the Dutchman. Lingard’s 28-second film of the chaotic scenes inside the coach ferrying United’s players to West Ham on Tuesday is proof of that. Lingard is a wally. Videoing himself on the team bus as it was pelted by beer cans tossed by West Ham fans and then posting the video on social media was the mark of a fool. Should United need a new coach – yes, that one with wheels and an improved SatNav – they might consider getting Lingard a car seat, such as the Mothercare Sport Car Seat in red with an integral harness, soft padded body, head support cushion, and chest and buckle pads. 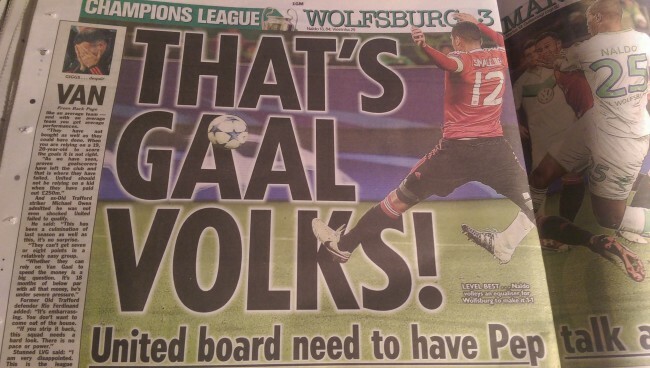 To blame Van Gaal for a 26-year-old using social media is madness. 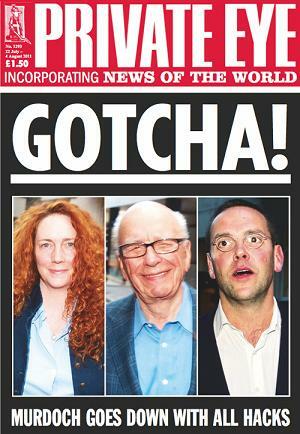 As for the Sun warning against the perils of mobile phone abuse and linking it to poor leadership – the bucks tops with the boss – well, let’s just say we wish former Sun and NoTW editor Rebekah Brooks (innocent of all any any involvement in her underlings’ phone hacking and ill discipline) well in her new job as head of News Corp.
With Lingard larking around, it showed how slack these players have become. Imagine Roy Keane, Ryan Giggs or Peter Schmeichel sticking their tongue out and shouting for “mommy” in similar circumstances. 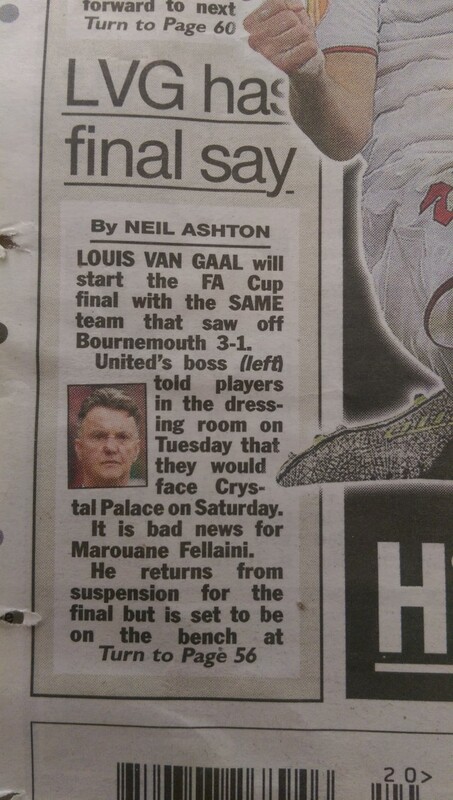 That dressing room, which accounted for 13 Premier League titles during Fergie’s rule, used to police itself. When someone overstepped the mark or broke the rules, the big voices at United would close in on them. Gary Neville, Rio Ferdinand or Keano saw to that. When Lingard took the trouble to send his footage to some friends, who helpfully posted it on social media, his amateur video went viral. 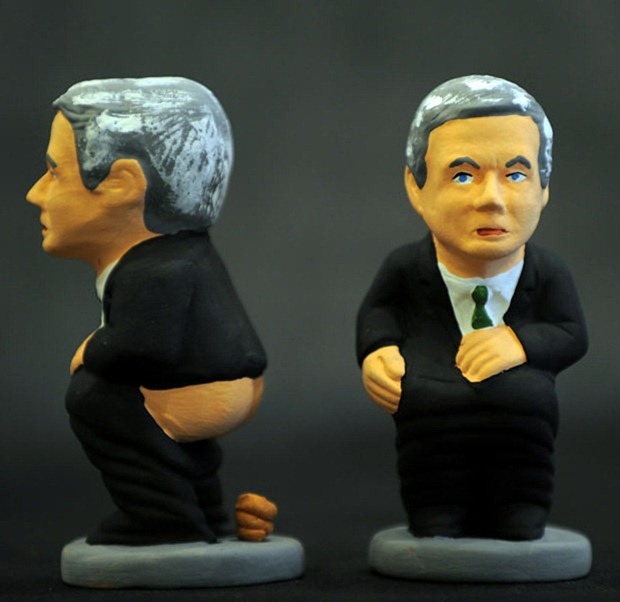 Sadly for Van Gaal, who is still trying to figure it all out at United, it showed another side to events at Upton Park. Ill-discipline is rife inside the United camp.